The Happy Tongue Pelham has attachments for two reins, one near the mouthpiece and one at the end of the shank. 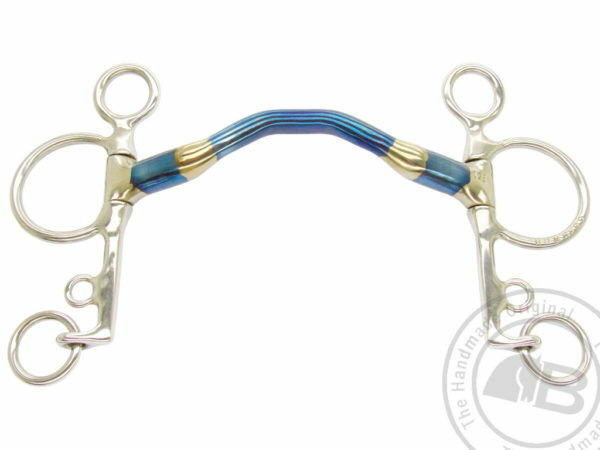 These reins have similar action to the curb and bradoon reins in the double bridle. A horse shaking its head when bit pressure is applied or its tongue trying to escape the bit are classic signs the horse has a sensitive tongue. With this in mind the Happy Tongue was created, it has a medium port creating space for the tongue. As a result, the bit relieves pressure, allowing the horse to relax. Hence, Happy Tongue is a solid mouth piece. It is curved and ported to give tongue relief. All Pelhams come with standard curb chain.